The JSU Chamber Winds, under the direction of Kenneth G. Bodiford, is a select group of approximately 60 highly skilled musicians who perform the finest in wind literature. The Chamber Winds utilize the practice of flexible instrumentation, which allows performance of many types of wind ensemble writing. Exploring traditional as well as contemporary works for band, this ensemble is known for its high level performances of quality literature. The Chamber Winds perform both on and off campus, tours frequently, and performs at professional music conferences. Students are selected for membership each fall and spring semester by audition. 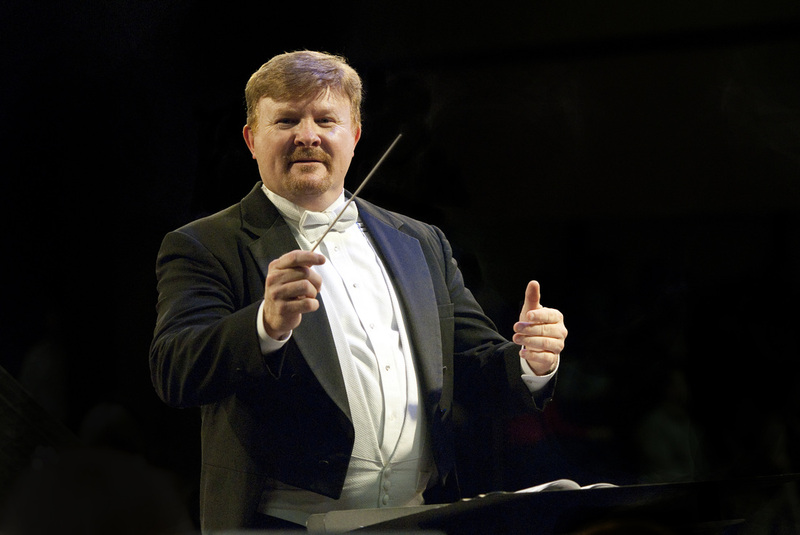 On April 10, 2012 The JSU Chamber Winds premiered a commissioned work in honor of Dr. David L. Walters' years of service to Jacksonville State University. The name of the piece is "The Shepherd," written by Patrick Rozzell and Justin Williams. 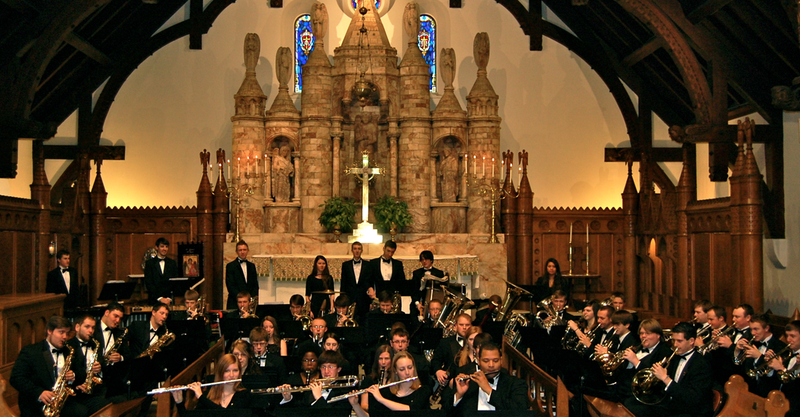 The concert was held at the First United Methodist Church in Anniston, AL at 7:30 pm. Those in attendance were given the opportunity to write a note of thanks to Dr. Walters which was collected and given to him at the end of the concert. Below are the program notes for "The Shepherd." 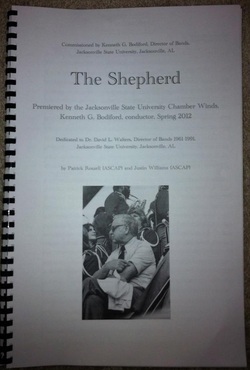 The Shepherd, written as a tribute to Dr. David L. Walters for his service as Director of Bands at Jacksonville State University (1961-1991), encompasses much variety. The fanfare-like opening, Off the Line, is indicative of the standard marching band openers of the early 1960's. Dr. Walters said for a long time he was "the only Northerner in The Southerners." The Arrival represents his coming from the "south side" of Youngstown, Ohio, to the southern states first at New Bern High School in New Bern, North Carolina, then to take the reins of the Southerners. The trumpet, Dr. Walters' chosen instrument, plays off stage almost as an echo of the new beginning to come. New Beginnings is an embodiment of the innovation and energy the Southerners has brought over the years not only to the collegiate marching arena, but also to the marching arts itself. A strong melody in the horns with playful counter melodies in the woodwinds hint to classic Southerners tunes and propels the ensemble through modulations and a full feature of the trumpet section. Tribute is a simple, yet sincere melody that stands as a token of gratification to a man who has given so many who love the Southerners a lifetime of matchless memories. The melody opens subtlety in the piano then grows to a strong and lush full band scoring. This section concludes with an ethereal trio of trumpet, horn, and trombone. Thematically, this represents a timeless Jacksonville sunset over a marching southerners rehearsal: A sight so many from this organization humbly hold near and dear to their hearts. Traditions of Excellence is a powerful and majestic celebration of the very tradition of excellence Dr. Walters nurtured and passed down to future generations of Marching Southerners. Stylistically indicative of the classic “ballad closers” of Dr. Walters’ era, the music builds to an emotional climax, with a strain of “I’ll Fly Away” bringing the work to a close. A final tribute to a man and the legacy he built…a legacy that, no matter how far away we go, always brings us home.